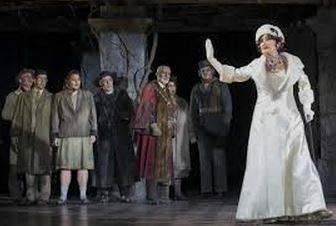 Bway Legend Chita Rivera classes up the evening with a very well-chosen series of snippets from “The Visit.” 83 years young, Rivera sang and yes, even danced, well,moved very well, to the music from Kander & Ebb’s last musical. Touching. “Curious Case” won just about everything in sight, as I predicted. And “Skylight” just won Best Revival of Play! Good to see Producer Scott Rudin accepting, though. This was a surprise! Rudin gave a VERY good speech, noting that this was the first time a David Hare play ever won a Tony. I guess a lot of people liked “Skylight” I didn’t so much. But Carey Mulligan was terrific. Another MCP play. Ugh. I’m so sick of the Older Man- Much Younger Woman Plot! It’s been done to DEATH! Enough is Enough! Josh Groban Brings Down the House with “You Will Never Walk Alone”!